Baby BAir is worn by the toddler like a vest. It is placed over the childs head, and secured by adjustable straps on both sides under the babys arms. 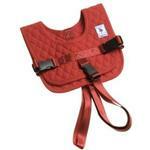 The third strap comes from behind, between the babys legs, and buckles to the front with another adjustable strap. The excess straps Velcro neatly to the vest so that there are no loose straps. The Baby BAir can be worn as any other garment would since it is constructed of 100% cotton and comfortable to wear. After take-off, the parent feeds their seat belt through the loop on the back of the Baby BAir, refastens the seat belt and tightens the seat belt. Your toddler can now be held, fed and even changed while both parent and child remain securely fastened in their seat. The parent can read, eat or even nap knowing their baby cannot fall or pull from their loving arms. Small Infant/Newborn Has a neck opening of 16"
Large Toddler Has a neck opening of 19"
Note: Neck opening is not adjustable. Choose smallest size that childs head fits through neck opening without body slipping through. Sizes fit child up to 40 lbs. The FAA requires children over 2 to have their own seat. Fits most children up to 6 months. Neck opening is not adjustable. SMALL fits child up to 40 lbs with head measuring less than 16 inches around. Fits most children from 6 months to 2 years. Neck opening is not adjustable. LARGE fits child up to 40 lbs with head measuring from 16 to 20 inches around.